The Native Americans in the camp next to Big Sand Creek slept without fear the cold morning of Nov. 29, 1864. Their Cheyenne and Arapaho chiefs had ceded most of their land and had been assured they would be safe at the encampment. Most of the men from the encampment had gone out hunting buffalo. An American flag fluttered from a chief’s tipi in pledge of this group’s agreement to live in peace with the white settlers crowding into the state. On that early morning, on a bluff above the camp, 650 calvarymen led by a Methodist minister named Col. John Chivington watched the camp in the pre-dawn gloom. Chivington ordered the troops to attack with deadly force, to kill all, adult and child. Two of his lieutenants refused. The remaining soldiers swept into the camp, shooting and hacking at the startled Indians. The butchery continued for eight hours and covered 50 square miles of the rolling prairie as soldiers chased down those who tried to flee on foot or horseback. When it finally ended, between 150 and 200 of the camp’s 500 residents were dead, many butchered and scalped. Two-thirds of the dead were the elderly, women and children. After the chase, the soldiers returned to the camp and killed and maimed any who remained alive. The soldiers returned to Denver, their saddles festooned with body parts cut from the victims. Some survivors hastily dug holes in the creek bank and hid. Setting out on foot, they found others who had escaped with horses and sought refuge at a Cheyenne camp on the Smoky Hill River. At first the soldiers were welcomed in Denver as heroes, but word soon began to spread about what had happened. Two military investigations were held after survivors and soldiers told the tale. The Joint Committee on the Conduct of the War excoriated Chivington but no charges were brought against the colonel or his men. Among the dead were several chiefs, ironically those most determined to find peace with the whites. The massacre revived the more warlike members of the tribes, who conducted more raids on wagon trains and isolated homesteads. One hundred and thirty-five years later, U.S. Sen. Ben Nighthorse Campbell of Colorado, a descendant of Northern Cheyenne survivors of the Sand Creek massacre, sponsored a bill mandating a study of where and how the massacre took place. Researchers from the National Park Service, the Bureau of Land Management and the Colorado Historical Society, accompanied by Native American observers, used oral histories, historical documents, aerial photographs and archaeological digs to discover bullets, camp equipment, and other items to identify the main site of the massacre. The historic site was authorized in 2000 and the land was deeded to the Cheyenne and Arapaho tribes, with management by the National Park Service. 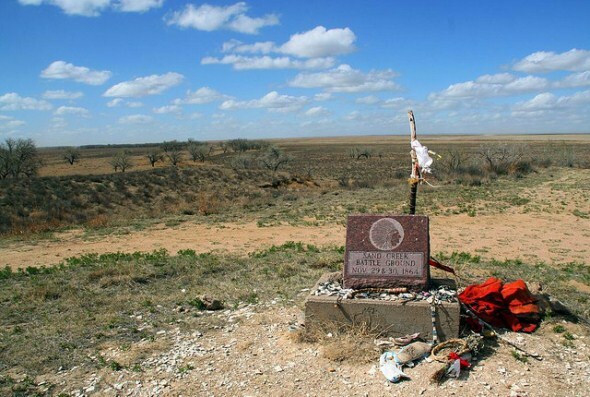 In 2007, the site was officially dedicated as the Sand Creek Massacre National Historic Site. It is about 125 miles east of Pueblo. There is no fee to visit the site, but donations are welcomed on-site. During summer months, Park Service rangers are available to lead tours of the site and there is interpretive signage for self-guided tours along a 900-yard trail. Beside the trail is a sacred burial ground for body parts, including many of the scalp locks taken as trophies that were later returned to the tribes. The last eight miles to the site are on a dirt road that may be difficult for some vehicles. There is water and a restroom at the site, but no camping is allowed and there is no food available. There is a bookstore with materials about the site and the massacre. In addition, a 600-mile Sand Creek Massacre Trail was dedicated in 2006 between Sand Creek and the Wind River Reservation in Wyoming, following the path of the Northern Arapaho and Cheyenne to their winter camp in central Wyoming. The trail follows, and is marked, along portions of several state highways. A Spiritual Healing Run for members of the Cheyenne and Arapaho tribes is held annually, with runners following all or part of the trail.